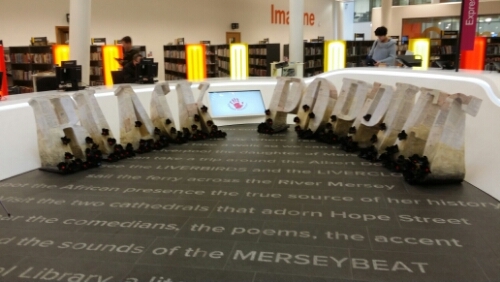 A couple of weeks ago, I visited the Central Library in Liverpool and I have to say it is simply beautiful. It recently underwent a £50 million renovation project and the money spent has definitely made the place so magical. My mouth first dropped when we landed outside, you are greeted by a variety of famous pieces of literature displayed on the footpath to the entrance. My friend and I spent a while looking what was on there, lots of classics! The last time I visited the library was in about 2010 when I was in University. I used to spend most of my free time sitting in the Central Library reading books and completing my coursework; it was a nice and relaxed atmosphere. When I stepped inside the change was drastic and completely different to what I know, it looked amazing. 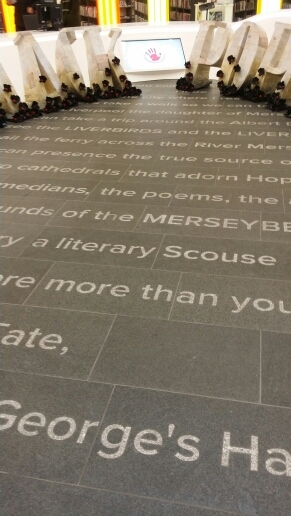 The floors display a variety of Liverpool related things, a nice touch. The Hornby Library and Oak Room are sections of the library that, although restored, are all the original features. They house over 15,000 rare books which include vintage copies of natural history and medieval manuscripts. 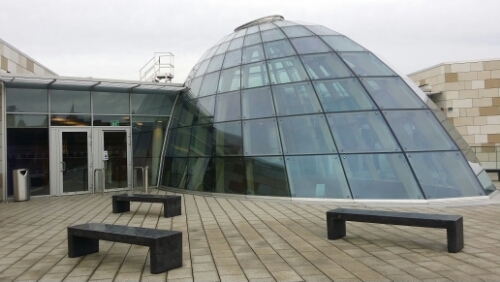 It doesn’t just stop there, if you venture towards the top, there is a rooftop area which has benches and a great view. How cool is the glass roof? 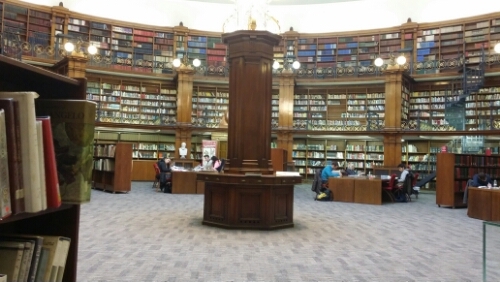 If you’re ever in the city of Liverpool I urge you to visit the Central Library! I’m a book blogger that will happily accept (most) review requests. However, there are times when I decline. If you’re asking a book blogger for their time to read and review your book, bare in mind how you ask! The amount of times I’ve received an email request that starts with just a ‘Hi’ or ‘Hi a Book and Tea’ as a greeting. Oh, I’m sorry, I didn’t realise my Mum named me that at birth, last time I checked my birth name was Clare (NOT WITH AN I – that’s another pet peeve). Take the time to find the bloggers name and start your request with this, it means you’ve actually spent time visiting their page and made a note of their name. 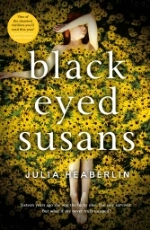 Add a blurb of the novel, provide author links, etc. Book bloggers will receive lots of requests so the easier for us to find out more about your book the better. I know they say ‘Never judge a book by it’s cover’, but we do have to judge a book by its blurb, so make sure you add the info’. Please don’t rush or pester a blogger to read your book quickly or email asking why they haven’t read your book, etc. In all fairness, I haven’t received many of these emails, but when I did I felt a little upset. I know you’ve kindly donated your book to me, but I can only read as fast as my life and body allows. Most of us do have offline activities, so they will have to come first! I always let authors/publishers know if I cannot commit to a review on time, and that is very rarely – I always review on time. Not all of the blogging world will like your book and that’s okay. Please don’t get offended if someone writes a negative review. I agree that it should be constructive, not personal, but learn from it and move on to better things. Thanks Google Images for the picture! Firstly, I’d like to start by welcoming you all into 2016! I hope the year brings you new and exciting things, and most of all, that you’re healthy and happy! This is just a little update on my 2015 reading challenge progress. When I started, I had every intention of reading 100 books because in 2014 I read 80 ish and thought ‘100 is definitely achievable’, so the challenge was set. Well, we’ve just finished 2015 and I managed 80 books. Not bad right? I’m actually quite pleased with how many I read because I honestly didn’t think I would have finished that many! In March last year, I started a new job and although I love it and wouldn’t change it for the world, the travelling and work hours take it out of you. Most of the time I get home from work and jump on the sofa and sleep, energy isn’t a positive factor of me, unfortunately – I lack it on a weekday. It pains me to say it but the last thing I want to do is read, I don’t have the concentration. However, it is getting better and in 2016 I hope to pick myself up and read a lot more! Let’s do this! Now that we are in 2016 I intend to read 100 books for the Goodreads reading challenge! How many books do you intend to read this year? I’d like to wish you all a fantastic Christmas and a Happy New Year! 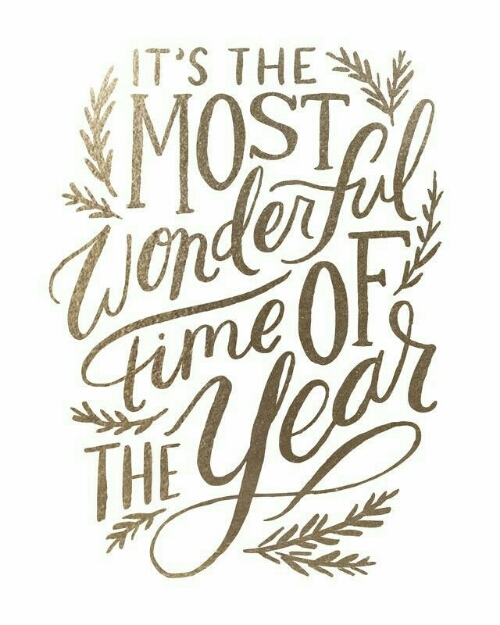 I hope you eat lots of food, read lots of books and of course, enjoy the time you spend with family and friends. I’ll be taking a blogging break and will return 4th January – see you then! Pinterest is a great source for animals in hats! I never imagined I would reach 250 followers, let alone 2,500! I’m sure you’ll have heard this all before, but it’s true, you never expect anyone would want to read your Tweets about books and rambles! So, rather than me just saying ‘thank you’ I’ve put together a (small) giveaway that will make one lucky person a winner of a £10 Amazon Voucher! – The giveaway is open to the UK only – sorry international readers (I have some ideas to say thank you to you too, so keep checking back!). – You will need a valid email address – so I can send you the gift! – The giveaway will close on the 13th December and I promise to send it before Christmas so you can celebrate! I usually post books I want on a Wednesday, but I thought I’d be a little different and post it today. As ever, there are lots of books thought I need in my life and although my TBR is massive, I still want more! Emma O’Donovan is eighteen years old, beautiful, happy, confident. One night, there’s a party. Everyone is there. All eyes are on Emma. Photographs taken at the party show, in explicit detail, what happened to Emma that night. The subject matter probably isn’t for the faint-hearted, but it’s a novel I’m quite interested to read. Nowadays, social media is everywhere and everything is documented through these platforms, and most of all nothing is a secret anymore! I’m quite glad I wasn’t a teenager growing up in these era. I’ve heard SO many good things about this one! It’s meant to be a little creepy, but good all the same. I’m fascinated with murder and crime stories, so I’m incredibly excited for this one! 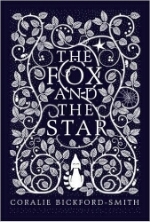 Just look at how pretty this book is! It was recommended to me by a work colleague and when I saw it, I knew why!